Even in the Grim Darkness of the Distant Future, you can still find Free Parking, but do not linger too long, or you will go directly to jail. 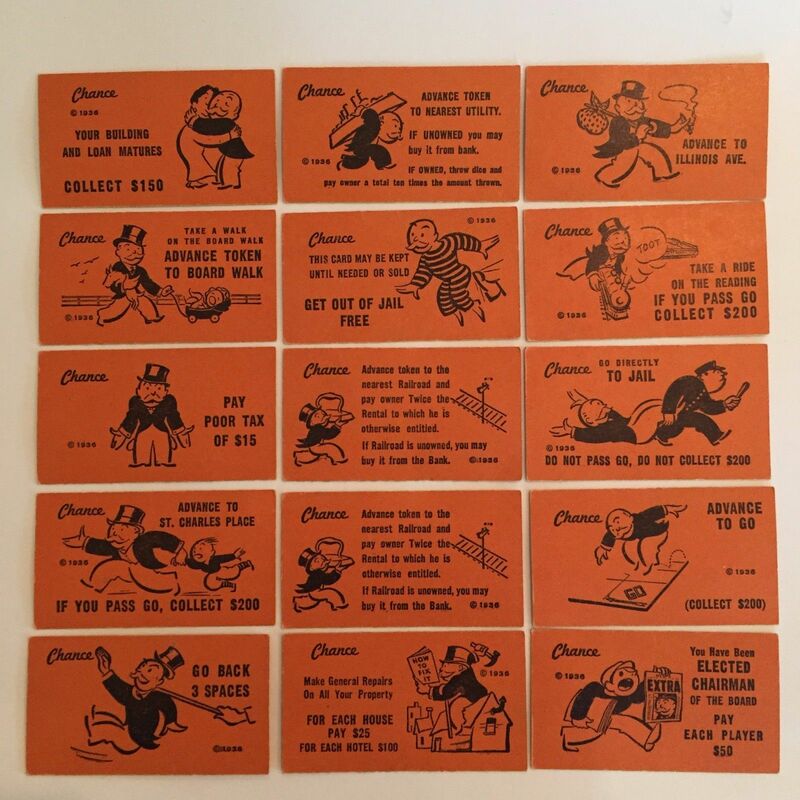 Do not pass go, do not collect $200. USAopoly has just announced their newest version of the oldest game in creation–that’s right, apparently the capital of Holy Terra, where the Emperor’s Palace is built is on what once was Atlantic City, which makes sense considering how much he wanted to have a Monopoly on the galaxy. This game is amazing. 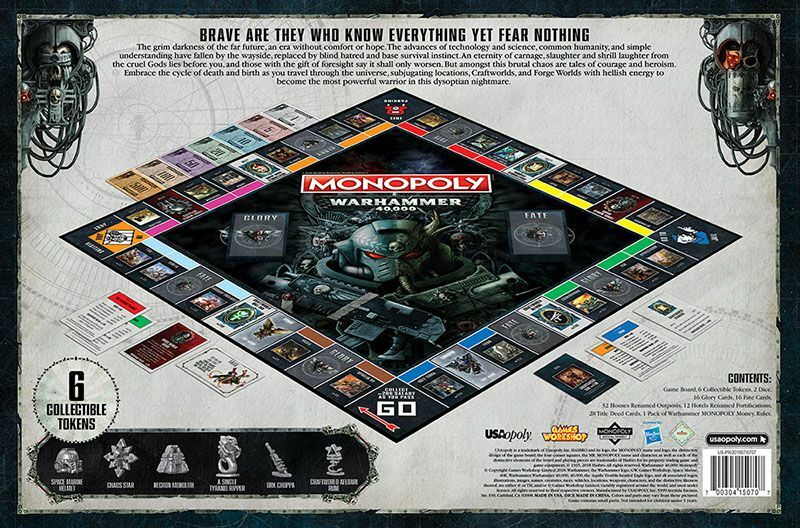 It’s Monopoly, but it’s set in the 40K universe, and that has some serious implications for everything. First of all though, let’s get to that announcement. 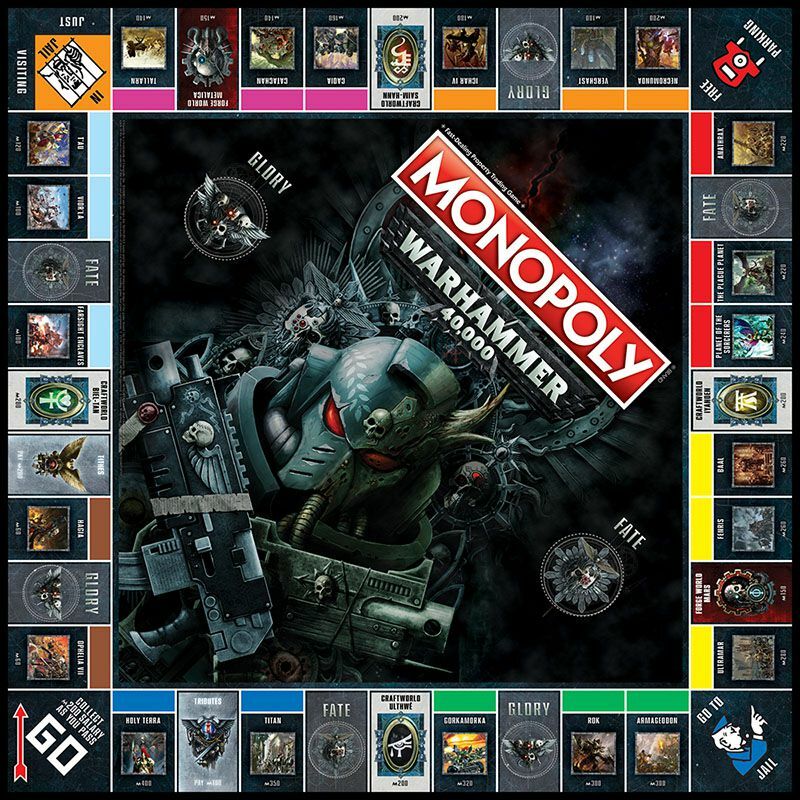 “Monopoly: Warhammer 40,000 takes the infinite war to new levels. 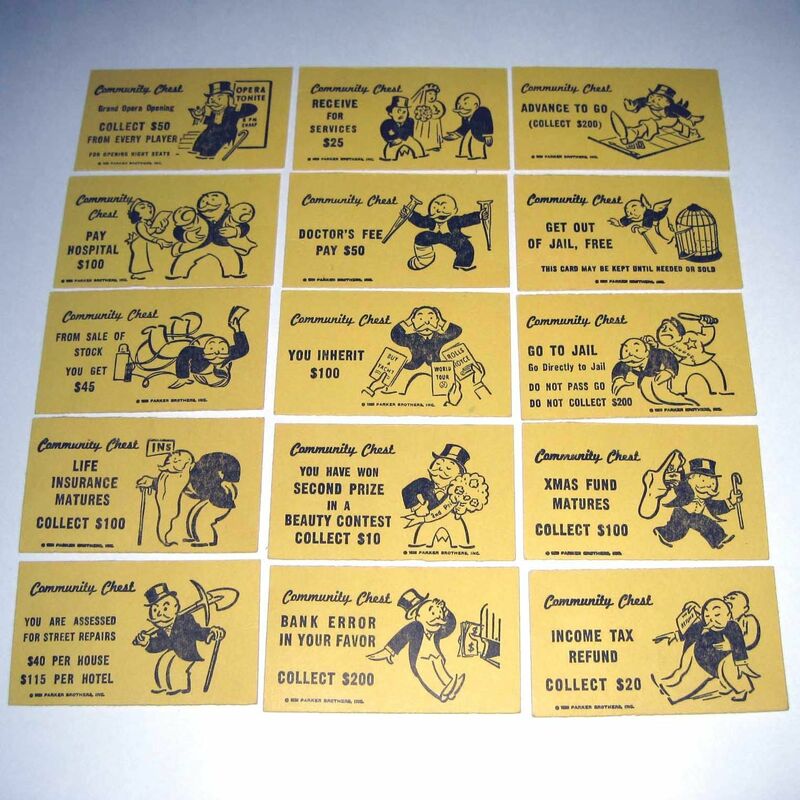 That’s all basic Monopoly stuff. And basic 40K stuff. 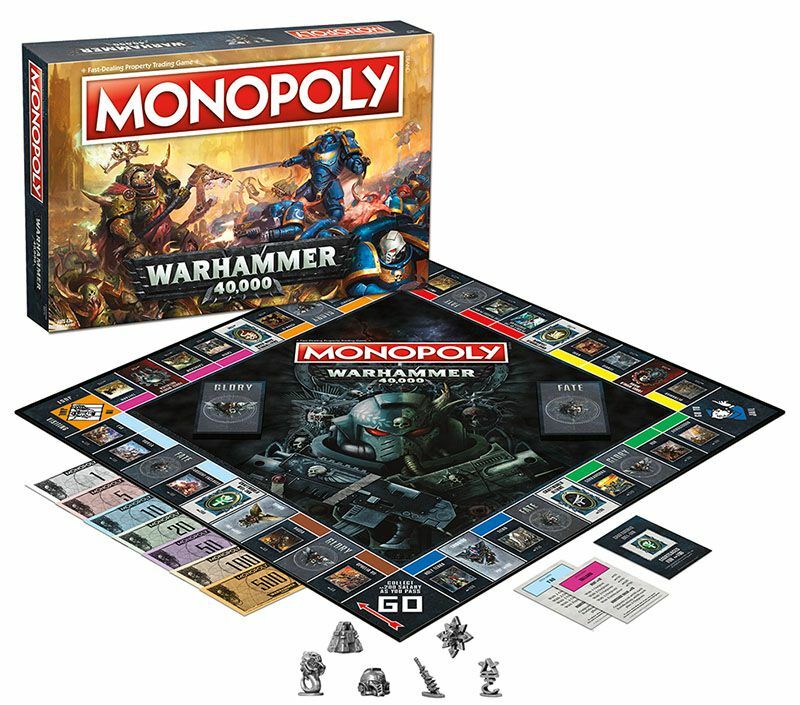 But let’s take a close look at what they’ve been putting out, because once we start digging into the trappings of Monopoly, we can learn a whole lot about 40K. This is it folks. The big enchilada. The board–so right away, it’s basically what you’d expect. 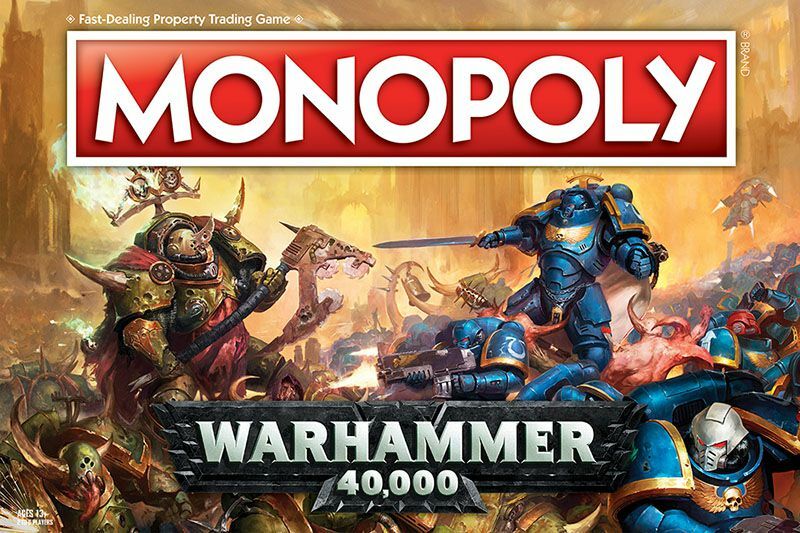 The familiar Monopoly board has been replaced with a number of 40K-centric properties, and it maps over surprisingly well. The Aeldari Craftworlds are the Rail Roads, the Adeptus Mechanicus are the Utilities. And much like in the game, it’s absolutely worth it to buy Aeldari at full price, and the Ad-Mech are nearly impossible to get a Monopoly on but will almost certainly inconvenience you. The most expensive properties, are, as you might expect, Holy Terra and Titan. But a close second are the Ork worlds of Gorkamorka, Rok, and Armageddon, which I suppose is officially an Ork world now. Makes sense–it’s where they go to live as they truly wish to. The most viable and tactically sound properties (if you subscribe to “math”) are the Chaos worlds and a number of Hive Worlds where terrible fighting has happened against Tyranids, Chaos, and Genestealers, requiring the incursion of a number of Imperial Forces. This all goes to show we now have a convenient way of ranking the factions within 40K–financially, which is the only way that truly matters. 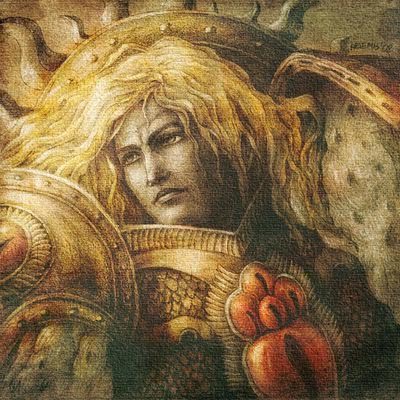 So the Adeptuses Custodes and Mechanicus, naturally, are the most expensive factions, then Orks, Marines, Chaos, Citizens of the Imperium, Militarum (mostly destroyed worlds), then T’au, and finally the Sororitas. Aside from that, there are some other amazing things to consider. So we know what the properties are–and that Chance and Community Chest have become Fate and Glory–but what else has changed? I mean Free Parking, Jail, Go, and Go To Jail are all the same. You can see the iconic uniform of an Adeptus Arbites officer sounding his sonic warning device and pointing at a miscreant, directing them to the Jails of the Imperium. But what then might lie in Fate and Glory? How much has anything changed? We have a few pictures of what they were before the Grim Darkness of the 41st Milennium. A few things are easy to imagine converted over. Life Insurance Matures could become Augmetics Installed–Xmas Fund Matures is clearly Candlemas Fund Matures. And of course Inquisitors throughout the Imperium are racing to try and get their hands on the Get Out of Jail Free cards, which are perhaps some of the most treasured items in the Imperium. Being Elected Chairman of the Board might have some distressing implications from the High Lords of Terra–but I’d like to think that even in the Grim Darkness of the 41st Milennium, you can still win second prize in a beauty contest. I mean he’s dead and he’s still wins every year. So second prize is pretty great. We also don’t know what you’ll be building on these worlds. Hives is a pretty good guess–maybe after you build four hives you can install an Imperial Cathedral, or some kind of Planetary Defense station. I don’t know what the 40K Equivalent of a Hotel is, but now that I’ve said it, I genuinely hope that it is a Hotel. I love the blend of all the melodrama of 40K’s world and…Monopoly, it’s this hilarious dichotomy that just lends itself to all sorts of fun. The other thing to be aware of is that hidden within this board is the 40K Campaign structure we’ve all been waiting for. After all, what better way to chart out the course of a campaign than to go through and roll the dice, see where you land, then if someone owns it and you don’t want to pay rent–battle for it. Play a game; you’ve got representations of a number of factions there, after all, so you could just fight over the battleground (or in Cadia’s place, the orbiting debris). One last thing, when this game comes out, we’ll now get to see what exactly money looks like in 40K. This is probably the first mention of money–at least that I’m aware of in 40K. In the Grim Darkness of the Distant Future, Free Parking is a haven, unassailable by even the mightiest armies. A place where all can–nay–must coexist.